There are a lot of perks that come with membership at the New England Aquarium, like express admission all year and discounts at the Cafe and Gift Shop. Now you can add our new Member of the Week contest to that list, too. How can members participate? Just show up and visit your Aquarium! We'll be randomly selecting members for this special honor throughout the fall. Meet Sara from Boston and her guest, Corra. 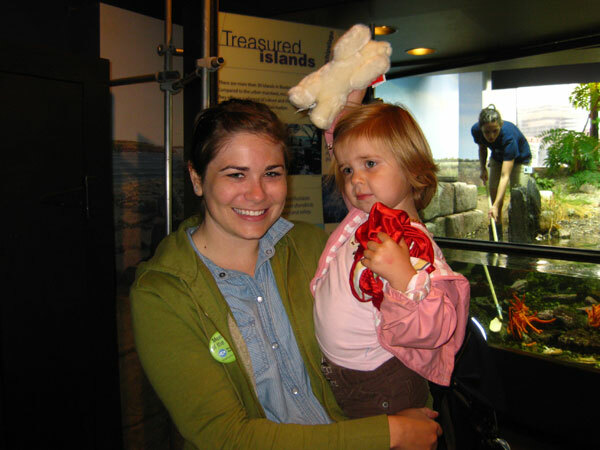 Sara and her husband first became members a little over a year ago because they’re “big animal lovers.” This was Corra’s second visit to the Aquarium with Sara, who is her nanny, and they were enjoying the shorebird exhibit when Sara learned she was our Member of the Week. One of the things Sara likes about being a member is that she can, “just drop in when we’re in the area,” for a quick visit. For being our Member of the Week, Sara was given a copy of the Aquarium's commemorative guidebook, a free 4”x6” photo from our friends at SharpShooter, and a reusable Aquarium shopping bag, while Corra went home with a stuffed polar bear and stickers from To the Arctic 3D. So what do you have to do to be our Member of the Week? Just visit! You could win on any day of the week, any time of day. We'll be announcing winners right here on the News Blog every Friday. So come on down and visit Myrtle in her new home in the penguin exhibit, check in with those boisterous sea lions, search for seadragons, see the little blue penguins in their temporary exhibit and experience the Aquarium's exciting transformation first hand. Who knows, you could be our next Member of the Week!